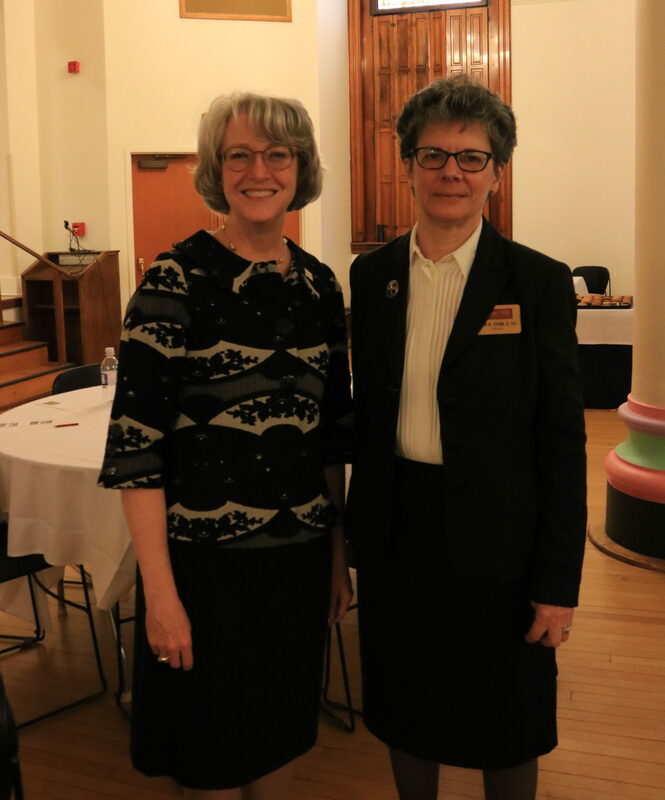 Ellie Fogarty (left), the Middle States liaison for Seton Hill, poses for a photo with Provost Sister Susan Yochum during Fogarty’s visit to SHU in March. Photo by S.Dumnich/Setonian. Seton Hill University is one of 530 institutions that are a part of the Middle States Commission on Higher Education. MSCHE is a voluntary, non-profit and non-governmental membership association that performs peer evaluation and accreditation of universities (private and public) and colleges in appointed regions of the United States and foreign institutions of American origin. “Quality improvement in higher education is our mission,” said Ellie Fogarty, vice president of chairs of MSCHE and Middle States liaison for SHU. MSCHE was founded in 1887, and its headquarters is located in Philadelphia with 34 staff members. Eligible institutions for accreditation by the MSCHE must be “licensed to operate as institutions of higher education within the Middle States region and be able to award postsecondary degrees” such as associate, bachelor’s and master’s or doctorate. Institutions of Middle States are located in Delaware, District of Columbia, Maryland, New Jersey, New York, Pennsylvania, Puerto Rico, the Virgin Islands and foreign locations. SHU is considered to be within the Mid-Atlantic region of Middle States. Every 10 years since 1921, SHU has received visits from MSCHE and is currently working to minimize the process to an eight-year cycle. The purpose of these visits is to reaffirm the accreditation process and ensure the school is meeting MSCHE’s standards. 2019 marks the 10-year cycle for MSCHE’s visit to SHU. On March 28, Fogarty visited SHU to inform students, staff and faculty about the reaffirmation of SHU’s accreditation and the self-study process. The reaffirmation of SHU’s accreditation is a two-year process, and over these next two years there will be a peer review of the university which will be analyzed through documents and interviews. The next step in the process is analysis and conclusions that the university is meeting the standards of MSCHE. The analysis and conclusions will then be used to improve and innovate a 100-page document known as the self-study report. From the report, peer reviews will be conducted that reflect back on the document, which gives SHU’s faculty a chance to converse and make sure they are meeting the seven standards put forth by MSCHE. The process is led by a vice president or president of another institution and must not be a competitor institution. The peer review process will occur six weeks prior to the late fall of 2020 to the winter of 2021. Interviews will be conducted on campus for clarification on goals and standards. Following interviews, an oral exit report will be put in place, and this ends after going through and meeting the seven standards. The peer review process involves faculty, but students are also encouraged to get involved. “Students can be involved on working groups that are arranged standard by standard, and the call for volunteers may come through the steering committee or through the student government association, that will be determined in the fall,” Fogarty said. The following are brief descriptions of the seven standards of Middle States accredited institutions. This standard deals heavily with students and affordability where services or programs must be in place to promote affordability. Also, these services or programs are in place to let students understand funding and incurring financial debt. An accredited institution must provide information about scholarships, loans, grants, etc. There must also be orientation, advising and counseling as well. The results of assessments are used for the improvement of the institution’s educational effectiveness. There must be clearly stated educational goals that align with the institution’s mission. This standard deals with financial budgeting and that the university is making comprehensive plans for facilities, infrastructure and technology. Human resources to support operations and how and where programs are delivered is also considered.